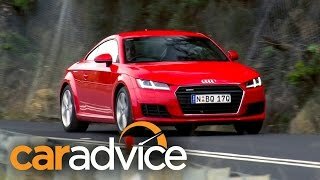 The all new Audi TT Coupe Quattro 2015 under Top Gear’s verdict holds numerous factors that make it ‘Coupe of the year’. We don’t doubt the decision but the dual reaction module inside a car lover’s brain instantly asks, why? And why not we say? Let that be curiosity to know perfection or a perfect Coupe from the house of Audi. The same strangled feelings took us close to this new release. 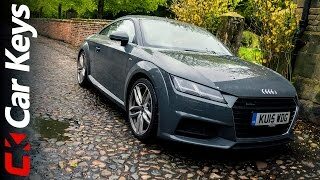 Audi TT Coupe Quattro made its release in UK market priced at 29,770 British Pounds to 35,335 British Pounds (approx $45,504 to $54010) OTR. We accept the fact price isn’t enough to be talked about while seeking reasons to perfection thus we decided to take a closer look. Let’s see what makes Audi TT Coupe Quattro 2015, Coupe of the year. Few major things that we noticed new/comfortable in Audi TT Coupe Quattro 2015 gets the Nappa Leather upholstered heated super sport seats close to topper in our list. Though the one topping here from our perspective is, the bespoke version of Audi virtual Cockpit, featuring a third, TTS-specific display settings. The Virtual cockpit is based over a 12.3 inch LCD display that fills the instrument house or can also be minimized to make some space for other functions. A multifunction steering wheel mounted over dash makes the ride safe with driver’s hand glued at a place. Talking more about the features mounted in Audi TT Coupe Quattro 2015, we have some listed to be common in Sport and S line versions both, like the MMI interface with a touchpad, Audi Music Interface, Bluetooth connectivity and keyless go. The Exterior of Audi TT Coupe Quattro 2015 holds its specifications at two levels; 18” and 19” alloy wheels further in list of option are to chose between Xenon or LED Headlamps accompanied with a speed dependent active rear spoiler and sports suspension. In precise the S line version gets an additional option for its buyers availing them to switch for S line sports suspension. This switch brings to Audi TT Coupe Quattro an additional low ride height by 10mm and that too at no extra cost. In all the exterior look of Audi TT Coupe Quattro convincing and justifying its award by the appealing styling and with ‘rule the streets’ quality. The Audi TT Coupe Quattro 2015 gets its power through a 2.0 TDI engine with Front wheel drive. The engine is capable of producing 181 hp and 380 nm torque and thus reaches a top speed of 150 mph with standstill to 62mph reach in 7.1 seconds. However Company also presents an option of 227 hp and 307 hp variants of 2.0 liter TFSI Petrol engine again with an option of either front wheel drive or Quattro wheel drive.